Mark Steinbecker (from left), Dave and Doris Steinbecker, Chelsea Kirn, Cole Steinbecker and Bill Taylor are the crew working hard to make Steinbecker Livestock a great place for cattle. They have a a lot of fun doing it. Dave Steinbecker Jr. changed the way he manages and grows stocker cattle in order to improve water and soil quality for his family’s operation and their community. If you told Dave Steinbecker Jr. — this year’s winner of the National Stocker Award sponsored by BEEF and Zoetis — that tomorrow was his last day on this earth, he’d show up about 6 a.m., as usual, and spend the day like he does every other one: growing and trading cattle. “I was always the kid in school looking out the window and wondering, ‘How do I get out of here?’ ” Dave says. 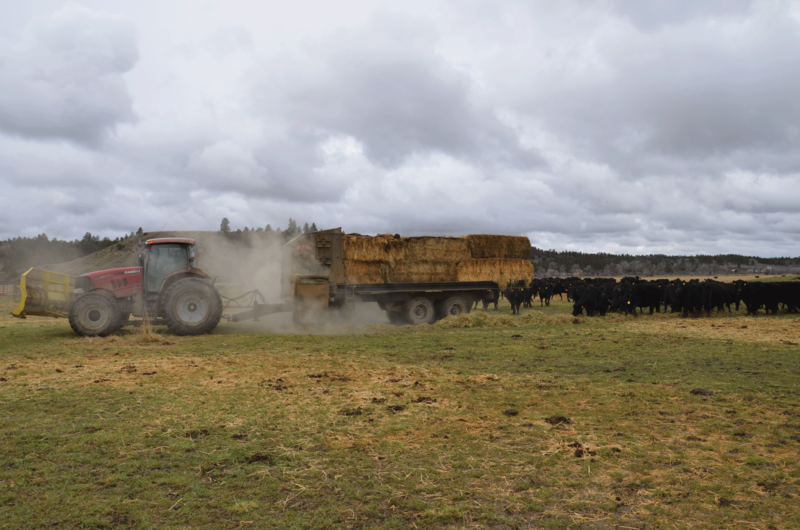 Rather than go to college after high school, he dove headfirst into the family’s cattle business, buying his own ground and creating his own operation along the way. But he didn’t do entirely by himself — Dave’s dad and namesake taught him the business, what to buy and sell and why, and how to manage them in between. It helps to understand at the outset that Dave and his brother, Mark, and their dad have their own operations surrounding Perryville, Mo., but they also leverage each other’s operations and expertise. For instance, Dave and his dad buy a large percentage of the cattle for his own and the family’s operation, Steinbecker Livestock. He also uses a trusted, longtime order buyer. Dave and his dad also market all the cattle for his operation and those of the family. Along with running his own similar operation, brother Mark handles all of the equipment buying, seed buying and the like for him and the rest of the family. The family partners on loads of cattle for their individual operations, and sells cattle back and forth when it makes sense. Dave loves what he does, but it’s icing on the proverbial cake. Choosing work for a final 24 earthbound hours has to do with the fact that every working day is spent with family, blood or otherwise. First, there is his wife, Doris, and son, Cole. There are two daughters — Kelly and Alanna — who live in the area but have medical careers. Then there’s Dave’s brother, Mark, and their dad, David Sr.
Dave’s right hands are Chelsea Kirn and Cole. Chelsea is more full-time than Cole until he completes his agribusiness degree at Southeast Missouri State University. Just as important, Dave says, is the retired Bill Taylor, who started working with Dave 11 years ago. Spend a day with them and you discover one thing you’d be correct to assume: They work hard. The other thing, not necessarily a given, is that they have a blue-eyed ball while they’re doing it. In general terms, Dave buys whatever makes the most economic sense at the time, from high-risk to low-risk, from 350 to 750 pounds, but all Nos. 1 and 2. For instance, in October he was buying lightweight bull calves from the Southeast. He’ll buy cattle direct, at the sale barn and via video. On the marketing side, Dave retains ownership in some of the cattle, many of them via value grids. Others he markets along the way. His family members do likewise in their operations. Rather than receive and keep cattle close for the first several weeks and then moving them to forage, Dave does the opposite. 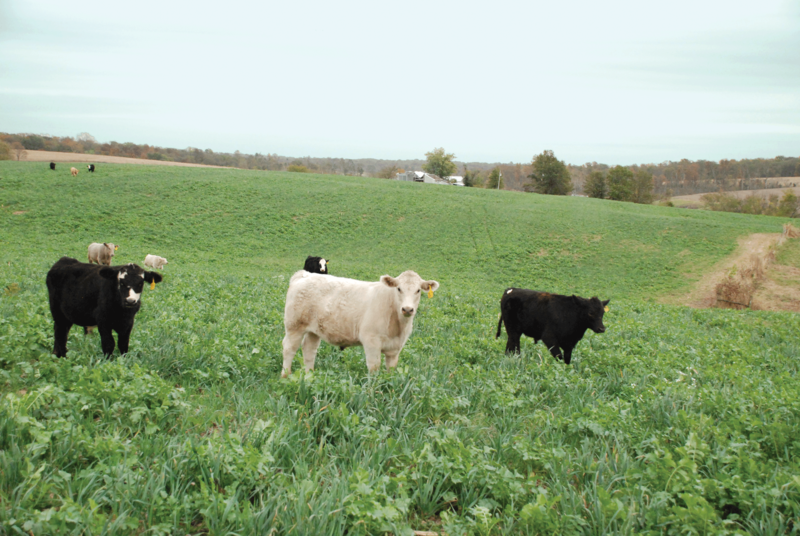 Steinbecker Livestock makes extensive use of cover crops to improve soil and water quality, along with boosting overall productivity. These calves arrived as bulls a week earlier and were grazing at the end of October. Depending on when they arrive, cattle are processed that night or the next day. Then they head to a pen for a day or two, where they have high-quality hay — Bermuda in this case, since most of the cattle come from the Southeast — and clean water. After a couple of days, calves head to their new home pasture. Dave is persnickety about the time of day and weather when new calves make the transition. He wants them to be able to do most of their walking during the day. Ultimately, the cattle are limit-fed a silage-based ration. The Steinbeckers grow and harvest corn, forage sorghum and/or rye for silage. They buy hay rather than produce it themselves because it’s cheaper. “By Day 50 or 60, they’re ready to move to somebody else’s hotel,” Dave says. He can grow the cattle cheaper at home, but he has a range of options to manage his home inventory. Cattle might move to a feedlot under the Steinbeckers’ continued ownership or someone else’s; or it could be to one of his own monoslope barns, or someone else’s in the family. “All of this gets a lot easier when you start them with a pickup,” Dave says. He’s referring to cattle health and how they handle. Cole or Chelsea use a 1-ton pickup with a cake box to feed calves new to their home pasture. They don’t just drive; they get out and interact with the cattle. Moreover, these folks don’t talk about low-stress cattle handling, they do it: day in and day out. Walk through a pen of recently processed cattle after a day of hand feeding, and they’re already up to the bunk eating before flaking the bales is complete. Same way on pasture; cattle are more apt to wander up to you than move away. “Animals know if you care. It’s just trying to make things for the cattle as friendly as possible,” Dave says. Never mind the variation in color; watch recently put-together calves on pasture seven to nine days after arrival and they look as bloomy and healthy as you’d expect weaned, home-raised calves to look. 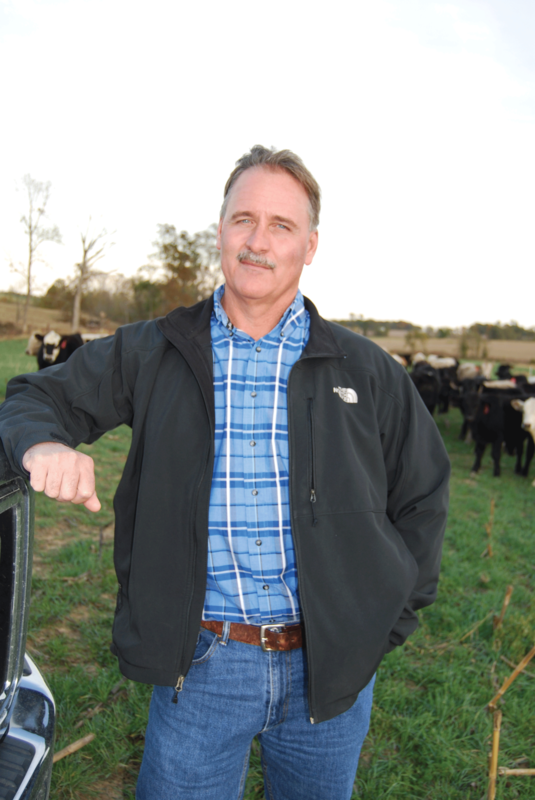 Running stockers is still the basic game plan for Steinbecker Livestock, but four years ago, he made significant changes to his operation in the name of improving soil and water quality. And no, regulators or neighbors weren’t breathing down his neck. He’s referring to a culmination of self-evaluation after seeing aerial photos of his farm in the fall. Like every other operation in the area, it was a beige shade of brown; the crops were in, pastures were dormant. Not that far up the road, though, in Clinton County, Ill., Dave says it was always “living.” Almost any time of year, you could find something green and growing. Folks there rely heavily on cover crops. At the same time, Dave was concerned about the future of his water. “Just as I think the people in western Kansas, western Nebraska and the Texas Panhandle are facing problems with water supply, we might have the same problem in this state, but for a different reason,” Dave explains. It helps to understand that Dave’s operation and others in Perry County sit atop an extensive network of caves; there are lots of sinkholes and riparian areas. There also happens to be an endangered species in those cave waters, a fish called the grotto sculpin. That’s another story. Suffice it to say, Dave and Doris were part of proactively crafting the Perry County Community Conservation Plan, which helped prevent the area being designated a critical habitat area. So, it all came together. Dave wanted a similar “living” environment at his place. He was armed with lots of ideas forged by years and miles of hauling cattle. The Steinbeckers still haul some of their own, but in earlier years they did most of their own trucking. Back then, Dave did a lot of driving himself, as in: Put in a day managing and trading cattle, go to one of the kids’ ball games, climb into the cab and drive all night. Repeat. For too many days each month. But Dave didn’t just drive; he noticed and learned. The two primary tools Dave used to accomplish his goals were the extensive use of cover crops and the addition of monoslope barns. Individually and collectively, both enable him to continuously improve soil and water quality while also increasing the overall productivity of the operation. First, the barns — the smallest houses 200 head. “It’s not just about gain on the cattle,” Dave says. “The more space cattle have, the easier and more efficient it is to straighten them out.” The barns allow them to run more cattle on the same number of acres while also having more pasture space for cattle they’re straightening out. 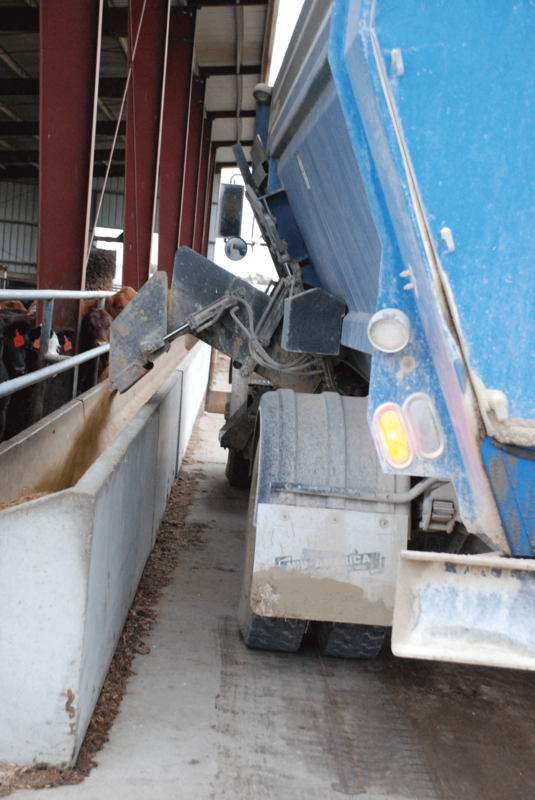 Manure from the barns also provides valuable fertilizer — about $200 worth per acre last year. That was just the raw value. Having monoslope barns at Steinbecker Livestock enables running more cattle on the same land base, while also opening up more pasture space for straightening out cattle. Staff recently began bedding the barns with sawdust rather than cornstalks and straw. “We were removing nutrients from the ground; now we’re using a waste product from the lumber industry and returning it to the ground,” says Dave Steinbecker Jr. The Steinbeckers had some of their top yields last year due to the nutrition of the manure, versus commercial fertilizers, improving soil quality and how the manure is applied. Dave pulls out a thick notebook outlining all of the fields. The Steinbeckers conduct an analysis of the manure and the soils in each field, and then match one to another. Now, the cover crops. The Steinbeckers use ryegrass, cereal rye, oats, forage sorghum and radishes. They plant crimson clover in February — not for the narrow window of forage, but to pump more organic matter back into the soil. “All of this serves as a way to filter the water before it gets to the creek. It’s the right thing to do. We’ve got to do something for the next generation,” Dave explains. Most of the ponds and creeks are fenced off from the cattle. Likewise, areas Dave refers to as woods are improved and maintained for wildlife: mainly deer, quail and rabbits. These woods include big and little bluestem, switchgrass and conservation trees planted by Dave and his family. Other improvements include “dry structures” to capture and pipe excess water from riparian areas to prevent soil erosion in this hilly country. All of this is to say that, when it comes to the quality of care for both cattle and the environment in his operation, Dave is unafraid of activists or anyone else who stops by with prying eyes. “Don’t hide; be what they want you to be,” Dave says.